Concentration Camps: Concentration Camps|Table of Contents|Full Camps Listing|What are the Camps? Together with the Mauthausen subcamp of Gusen, Ebensee is considered to be one of the most diabolic concentration camps ever built. The Nazis designated Ebensee as the site (codenamed “Zement”) to carry on with Germany’s rocketry program, as British bombers had badly damaged the V-2 rocket facility at Peenemuende. However, Ebensee was not used for rocket work in the end, but became a sub-camp of the notorious Mauthausen concentration camp near Linz. The construction of the subcamp began in late 1943 and the first 1,000 prisoners arrived on November 18, 1943, from the main camp of Mauthausen and other Mauthausen subcamps. A concentration camp - barracks, fences, guard towers - was put up on a forested tract adjacent to the town. The main purpose of Ebensee was to provide slave labor for the construction of the enormous underground tunnels in which armament works were to be housed. After rising at 4:30 A.M. the prisoners dug away at the tunnels until 6 P.M. After some months work was done in shifts 24 hours a day. There was nearly no accomodation to protect the first batch of prisoners from the cold Austrian winter. Thus the death toll increased astronomically. 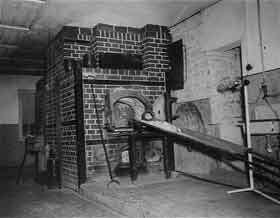 Bodies were piled in heaps, and every 3-4 days they were taken to the Mauthausen crematorium to be burned. Ebensee did not yet have its own crematorium. The dead were also piled inside the few huts that existed. The smell of the dead, combined with sickness, phlegmon, urine, and feces, was unbearable. The prisoners wore wooden clogs. When the clogs fell apart the prisoners had to go barefoot. Lice infested the camp. In the morning food rations consisted of: half a liter of ersatz coffee, at noon, three-quarters of a liter of hot water containing potato peelings, and, in the evening, 150 grams of bread. Due to this ill treatment, the death toll continued to rise. The camp was surrounded by a barbed wire fence, small towers with machine guns, and shacks for the SS. The Mauthausen commandant Franz Ziereis sent his most capable and vicious man to head the camp, Georg Bachmayer. After establishing his rule, he once again returned to Mauthausen and left the camp under the command of an Obersturmfûhrer who proved to be totally deranged. The combination of these two became a reign of terror. One of their favorite methods of torture was to tie a prisoner’s arms behind him, with the hands side by side and thumb to thumb and then suspend him from a tree about eighteen inches off the ground. Bachmayer would then release his favorite dog, an Alsation called “Lord,” to attack the prisoner, who would be left to die a slow and agonizing death. In early 1944, a new commandant was appointed in Ebensee, Obersturmfûhrer Otto Riemer. During his period the conditions deteriorated even further. He personally beat, shot, and tortured prisoners daily. He openly offered extra cigarettes and leave to those sentries who could account for the largest number of deaths. If a sentry at the end of a day did not have a sufficient number to his credit, he would knock off the cap of a prisoner and throw it into a forbidden area. When the prisoner went to retrieve it, he would be shot dead. Riemer, like Bachmayer, was a great lover of wine and women, and he would often go to wild drinking parties with some of the younger members of the SS. On one occasion, May 18 1944, he returned to camp after an all-night drinking session with 12 of his SS command. They entered the camp shooting wildly with their pistols and roaring with delight as panic-stricken prisoners scurried out of their way. Fifteen prisoners died as a result of this display. Eventually the camp expanded and prisoner blocks were established. The leader of block 19 was an extreme sadist. He would wait for his prisoners to return from the day’s toil and then compel them to perform exhausting physical exercises far into the night. The following morning after a sleepless night, the men would be forced out to another full days work. Nearly all the members of his block died from exhaustion within ten days. By this sytem of elimination he had succeeded in killing in a most economical manner and was rewarded. When the subcamp at Wels was constructed, he became the camp leader. Ebensee eventually had its own crematorium. In the beginning, the SS dispatched corpses to Mauthausen for cremation, but by mid-1944, a crematorium was built apart from the other buildings with an enormous single chimney which rose high into the air. Block 23 corresponded to the “Bahnhof” at Gusen or the “Russenlager” at Mauthausen. Here the dead and the living dead were flung together in big heaps. 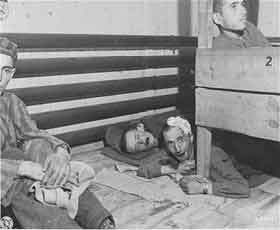 When the camp was at full strength, as many as 600 prisoners lay on the bare floor at one time. When the war was coming to an end, the mass evacuation from other camps put tremendous pressure on the Mauthausen complex which was the last remaining camp in the area of Nazi power. The 25 Ebensee barracks were designed to hold 100 prisoners each. At the most they held 750 each. To this number one has to add the prisoners being kept in the tunnel systems and outside under the open sky. The creamatorium was unable to keep pace with the deaths. Naked bodies lay stacked up outside the blocks and the crematorium itself. At the closing weeks of the war, the death rate exceeded 350 a day. Two tanks from a squadron of the U.S. Third Army liberated Ebensee on May 5, 1945. By that time, there were around 18,500 prisoners in the camp. Jews made up approximately one-third of the inmates. Ebensee was made up of several groups of prisoners: prisoners of war, political prisoners, criminals, Russians, Poles, Czechoslovaks, and Gypsies. There were inmates of 20 different nationalities in Ebensee, but the Jews were treated more harshly than other prisoners. Toward the end of the ear, their number in Ebensee increased to 40 percent. Around May 19, 1945, Bachmayer commited suicide after first shooting his family. Riemer managed to escape. There are three Holocaust-era related sites still standing in Ebensee today: the former camp grounds with two mass graves which now serve as a memorial; an immense man-made tunnel in the mountainside, dug by slave laborers from the camp to aid the German war machine; and a small museum in the center of town devoted to 20th century history, called Zeiteschichte Museum Ebensee, which opened in 2001 in an old school building that was no longer in use. The museum holds lectures and readings and publishes a journal dedicated to the war period. The museum also hosts an annual commemoration event, where Ebensee survivors from other countries come to the former sit of the camp. The tunnels drew nearly 8,000 visitors in 2007. The only thing that remains of the concentration camp where the inmates were imprisoned is the gray concrete entrance gate that arches over the road. A residential neighborhood now exists in the town. Visitors can still climb up the Loewengang, the Lions’ Walk, steps carved into the stone on which inmates were marched from the camp up to the mountainside to hollow out the enormous caverns. Sources: Forgotten Camps; Rosenfelder, Reuven, "Horror off the Beaten Track," The Jerusalem Report, (September 1, 2008).